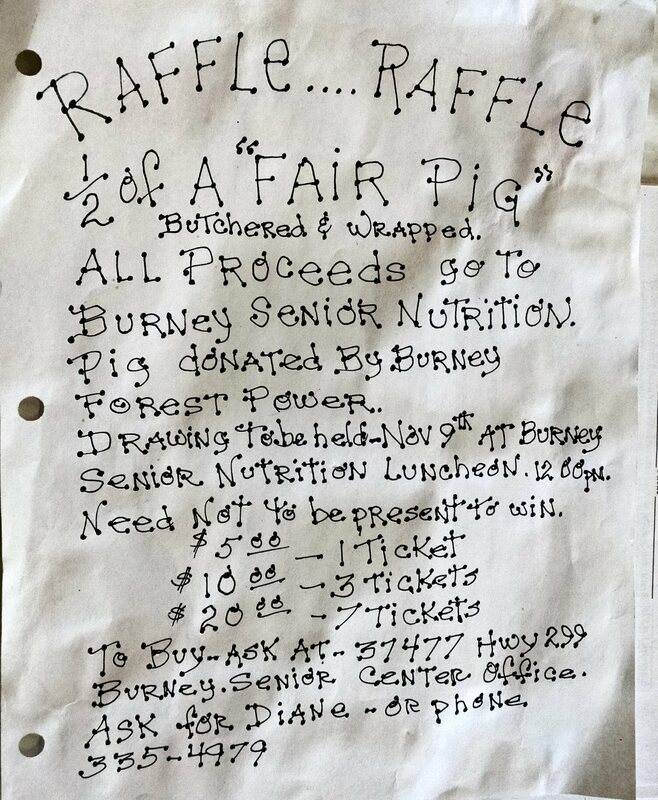 On November 9th, at the Burney Nutrition Senior Lunch at 12 noon, 1/2 of a “Fair Pig” will be raffled off. The meat comes butchered and packaged. Any one is welcome to buy a ticket. Tickets are available at the Burney Senior Nutrition Office at Tri Counties Community Center at 37477 Main Street in Burney. Or call Diane at 335-4979. Raffle tickets are $5 for one, $10 for three, or $20 for 7 tickets. You do not need to be present to win. The pig has been donated by Burney Forest Power. All proceeds go to benefit the Burney Senior Nutrition Program.